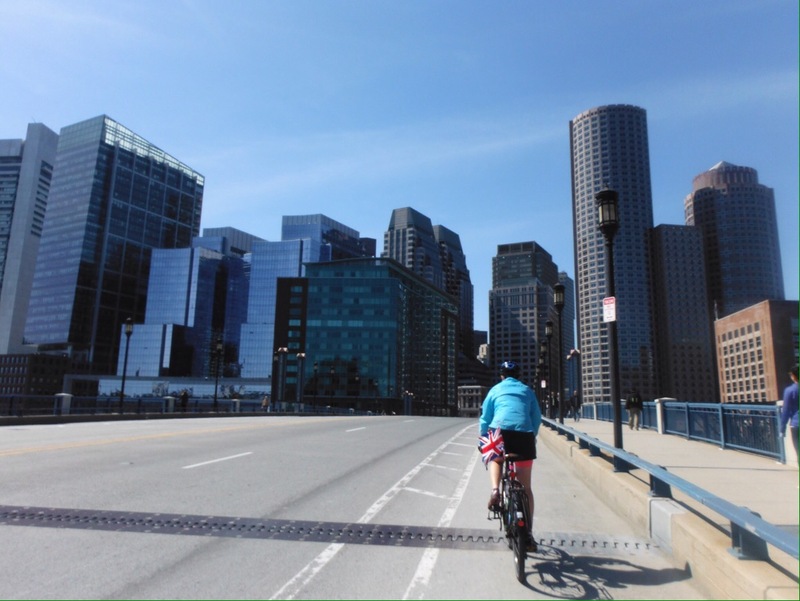 Leg 2 of our little bike ride begins – across the USA! After a month of being at home it was actually a little difficult to tear ourselves away. We had our cake ate it, as much cake as we liked, and I in particular ate a lot of it. And everything else that was put in front of me. We were at home with all of the good stuff (family and friends, time, a fridge with choices of food, an electric kettle) without any of the bad stuff (going to work, mortgage, bills). Every day was a Saturday; there were no Sunday evenings for us. So it was actually quite tough to box up the bikes and repack all of our belongings back into panniers for the transatlantic flight. But once we got off the plane and us and the bikes were intact, and we saw our first dunkin’ donuts, the excitement flooded back. U-S-A! Boston is a really nice city, and a great introduction to the USA for the slightly homesick Brit. It has a good amount of historical buildings, there are English road names everywhere and just to help, we had booked a talk at the British International School. The sun shone and we ate clam chowder. 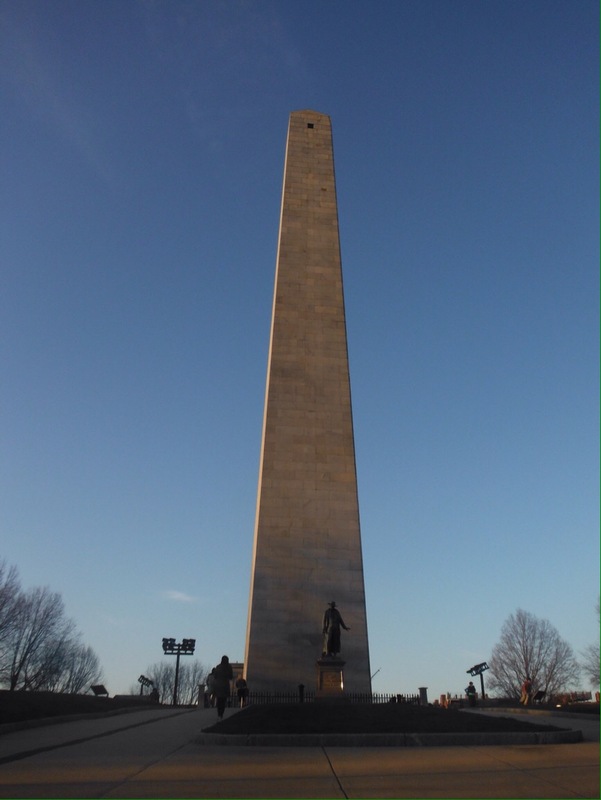 We rode our bikes with British flags flying proudly behind us up to Bunker Hill monument, the site of a battle in the American Revolutionary War that although won by the British, spurred on the colonies due to heavy British losses. We visited a science fair (which in true American style, turned out to be a huge event) and were fed bugs by students from the British school wondering if they are the food of the future. They were a bit dry for my liking, and there’s no way that a plate of crickets could fuel me for a day on the bike. Walking around in shorts when it was not quite ‘shorts weather’ with our fine athletic figures turned a few heads and we were asked at least 10 times if we were in town for the marathon. Not likely. Some might disagree but I think cycling 5000 miles across the country is much more preferable to running 26 miles. But it was fun to watch, the city really gets behind the event and we even had someone to cheer along – Rosie, the daughter of our hosts, who ran a very impressive 3:08. It was so exhausting watching the race that we had to have extra helpings of ‘marathon cake’ back with the family after. We rode out to the sea and dipped our wheels in the Atlantic Ocean (mandatory before starting a cross country ride). Our last morning was spent talking to a class of Y5s about the trip so far. They were really inquisitive and spent about 30 minutes asking questions such as ‘what inspired you to do a biking trip’ ‘who rides faster’ ‘how did you tell the donkeys apart’ and ‘are you going to Hawaii/Asia/the Middle East/etc…’. As with all kids so far, the picture of the donkeys received the most positive attention. 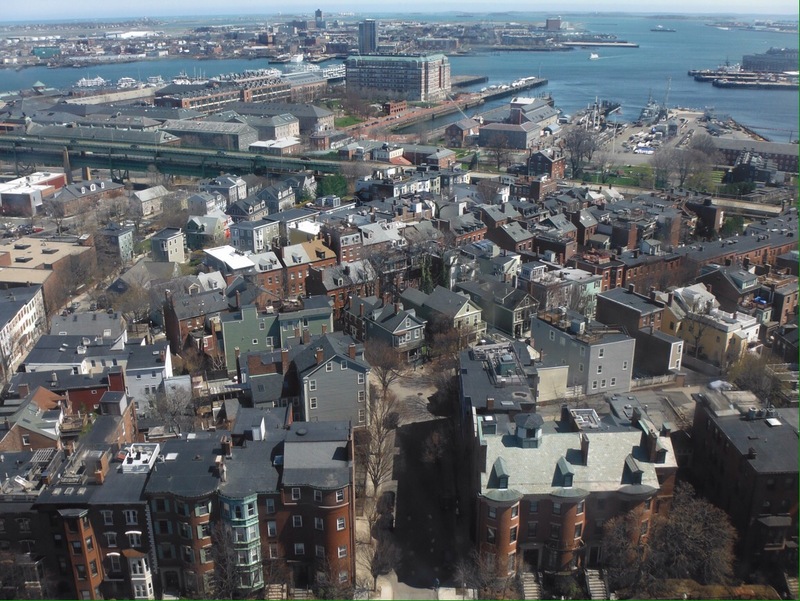 The time in Boston was also needed to get used to life this side of the Atlantic. After 5 months in Europe learning new languages everywhere we went, it is a bit strange to have to do that here as well. But before we knew it we were slipping words like restroom, sidewalk (ok that makes more sense than ours), trash, vacation, faucet (saying tap water elicits blank faces) and a new one to me, rotary (no? Me neither. Roundabout!) into sentences. More difficult is having to translate lbs into kgs, remember that a US pint is smaller than an English pint, and talk temperature in farenheight (not a clue). So after five nights in Boston we had grasped the basics of the American language, adjusted our body clocks and roughly planned a route to Toronto, a mere 600 miles away. We were ready to hit the road! 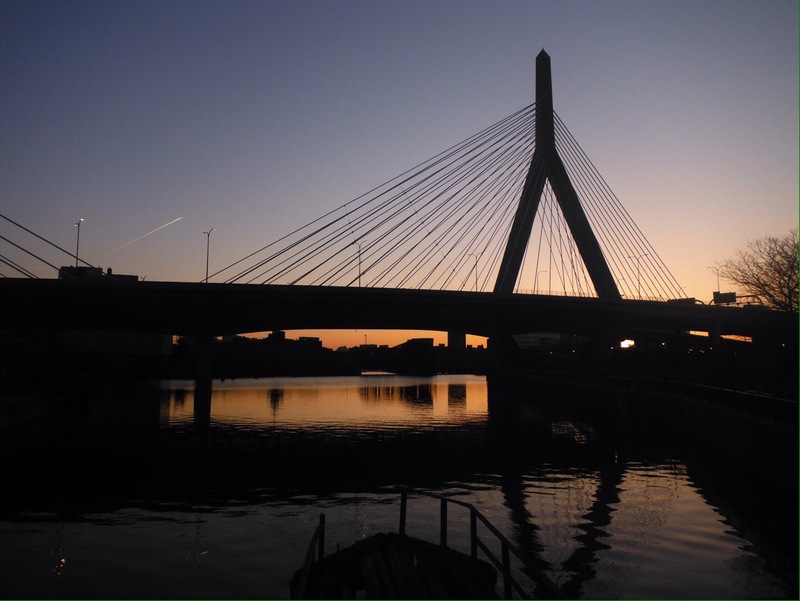 Big thanks for making Boston great to Orian and Caroline, Norma, Bob and Rosie (and Eleanor), and Caroline and Cynthia. Six days in a flat in Lagos doing very little except sleeping, wandering around and eating pastel de natas allowed us to recharge the batteries, knowing that once we left the south west corner of Portugal we would be riding north towards home for the first time since leaving over four months ago. We met up with our English friend Bob (who we met before the ferry to Barcelona, he made us a cup of tea…) one day for his birthday lunch; watched Leicester City beat both Liverpool and Manchester City and turn into real Premier League title contenders; and after spotting an ocean rowing boat with a GB flag dwarfed by the yachts in the harbour, discovered that a bunch of strapping Englishmen were leaving Lagos the same day as us but heading across the Atlantic to Venezuela, hoping to beat the world record for that crossing. (They did). We also ate many pastel de natas. What we didn’t use our time to do was catch up on the blog, plan our route ahead, etc etc. Before pointing our wheels North towards home we rode out to the most South-Westerly point on the European mainland, Cape St Vincent. The ride there was memorable as being the first time a motorhome with GB plates had tooted and waved at us as we passed – we had made a habit of waving madly whenever we saw one but usually this was ignored. The cape itself had a touristy lighthouse and a busy car park but plenty of quiet spots to sit on the rocks and watch the waves crash against the cliffs. We had saved a can of Sagres (one of the two Portuguese beers that you find everywhere) for a celebratory lunch before riding north up the west coast for a few hours to find somewhere to camp. 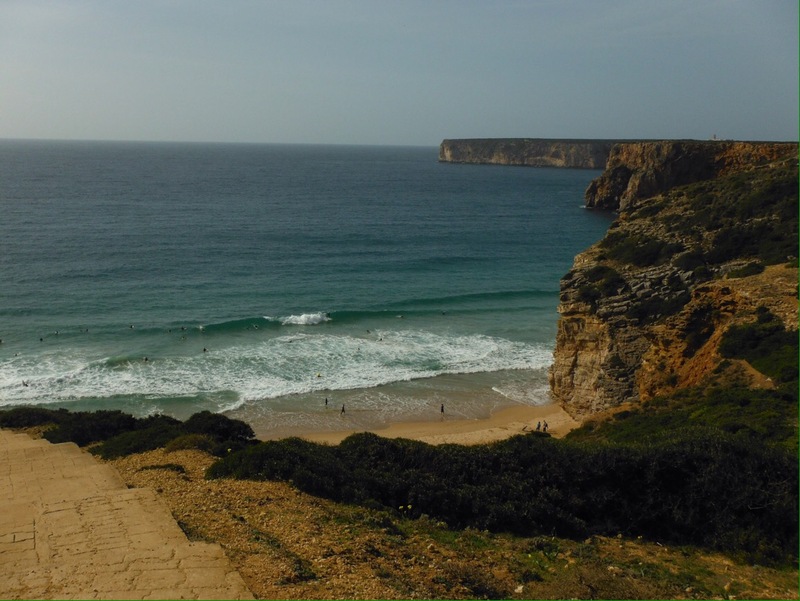 This stretch of coastline was probably our favourite of the whole trip – rugged cliffs, huge waves, small coves, tiny towns with little more than motorhome car parks and miles of empty beaches. Pretty much the opposite of the Algarve coastline. The road is inland but there are plenty of opportunities to turn off down to the sea – these are generally unappealing on a bike as they involve out-and-back detours often down a huge hill but when the coast is this nice… One day we even stopped at 3pm, unheard of for us who normally ride until it’s too dark to see, to walk a bit of the coastal path, take in cliff-top views and watch the sun set over the Atlantic ocean. The closer we got to Lisbon, the worse the weather got, and after a day of solid rain we arrived at our hosts in the Portuguese capital dripping wet and took two days for everything to dry out. 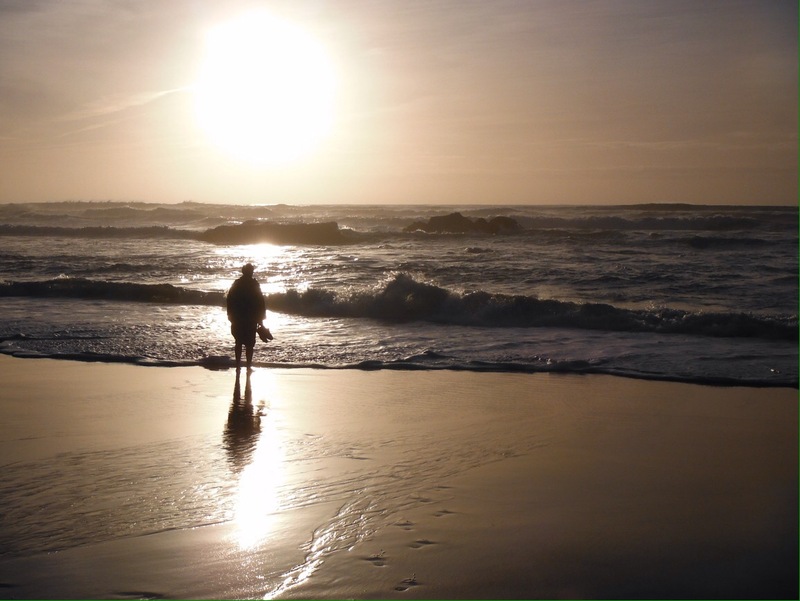 Lisbon is surrounded by upmarket holiday resorts and the one place everyone had told us to visit if we were in the area – Sintra. Perched high up in the hills about 30km from Lisbon, Sintra has palaces, an old ruined castle and gardens to visit, and if you google it (other search engines available) you will see why it attracts the crowds. 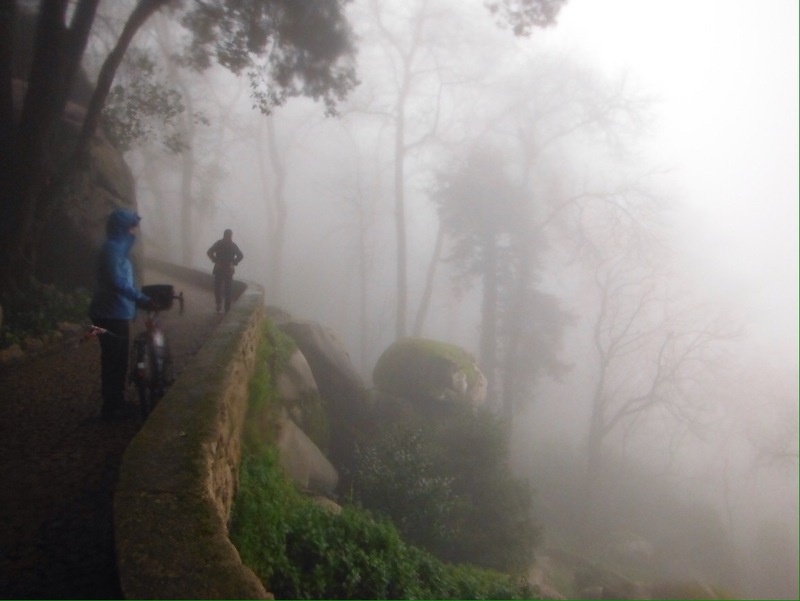 However the weather was even worse, and after riding uphill to get there, including a really steep cobbled road (aka death trap in the wet) could see nothing but cloud. We weren’t the only fools there – a few coach loads of people were wandering round with their umbrellas up craning their necks trying to imagine what was the other side of the crowd. Customer service in Portugal hit a new low when we weren’t allowed into either of the palace or castle cafes as they were inside the gates. So we drank nearly-warm tea from our flasks and took shelter under a stone walkway. Until we were moved on from there too. 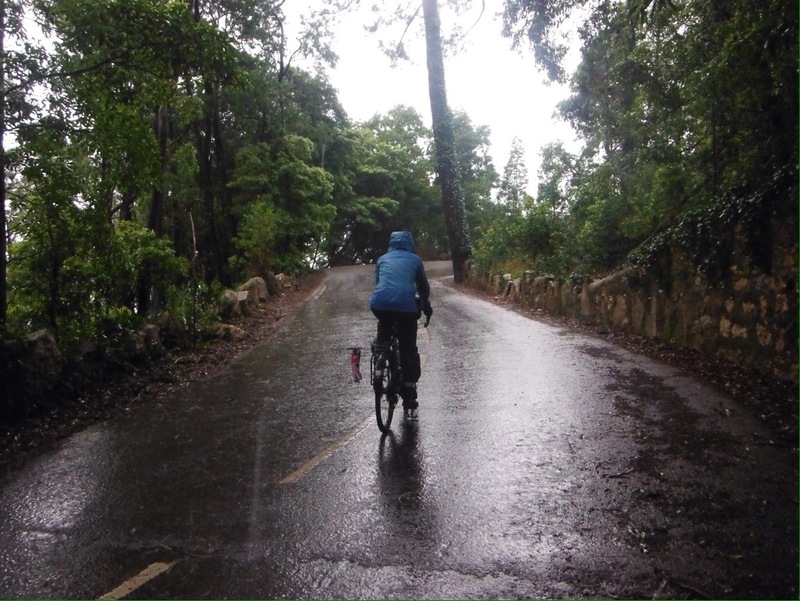 No sympathy for wet cyclists in Sintra. So we went to a cafe and ate tourist priced (double the usual) pastel de natas. The weather improved a bit (it didn’t rain all the time) as we rode up the coast to Aria Branca youth hostel to have a day by the sea. It is right on the beach and very cheap, but being winter was almost empty. One night there was only us and a middle-aged Swedish guy, on a bike, who was staying there for 4 months and doing what looked like very little. Bit weird. The sun was out but in place of the driving rain was now gale force winds, and it was difficult to stay upright walking. The day we packed up to leave we got 5 miles down the road, realised we could hardly keep the bikes upright never mind ride, and so turned round and went back to the hostel. The receptionist was not surprised to see us return. 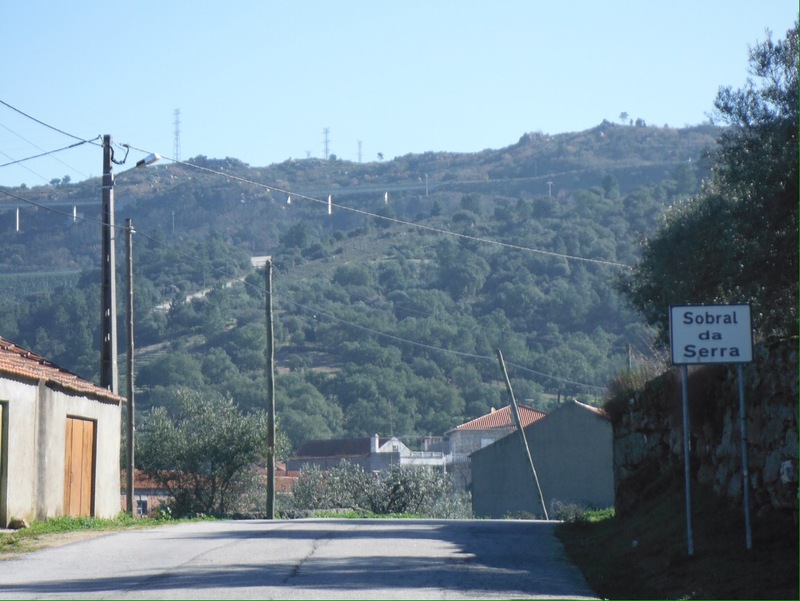 On the recommendation of local cyclists we then left the coast headed inland towards Serra de Estrela, Portugal’s highest mountain range. On the way we stayed with a couch surfing host who was doing a volunteer exchange, and had a fun evening with her and the other young volunteers in the town. They had taken to wine tasting (wine is so cheap, what else would you spend your spare time doing) and we were up until 1am helping taste wine and feeling old. It took us about a week to recover. The small road in the foothills of the mountains that we followed went through small pretty villages but unsurprisingly took us up and down some seriously steep hills. One night we stayed at a campground (we were as usual the only tent) and gained attention from all directions – an English couple invited us into their camper to drink wine and eat cheese and biscuits (yes please), the Dutch owner gave us blankets to keep warm (definitely yes please) and the resident cats swarmed around our pitch and climbed all over our stuff as we tried to pack away (less helpful). Thanks to Jim and Tricia (again, you made it onto two posts! ), Jose for the tips, João and family, Miguel, Daniel at The Bike Shop (Terrugem), Henrique and Paula, Muge and the other international volunteers, and Rich and Angie. Arriving in Granada meant that for the first time since arriving in Barcelona three weeks ago we had finally reached one of the places on our must-see list. Ever since seeing a picture of the mighty Alhambra palace in front of snow-topped mountains this was one place we wanted to work into the trip. We just hoped the gravel road trek across inland Andalucia was worth it…. It was. Although taking a couple of days to rest in a city where the sun always shines and every time you order a beer it comes with a side of food was unlikely to disappoint. First up was a visit to the Alhambra itself, the 13th century walled complex/palace/castle/fortress that stands high above the city. The fort and old walls were cool to wander around, the palaces and gardens unbelievably intricate and fancy and being perched on top of a hill there were several different vantage points across the city. We were pleased we booked an early slot as by lunchtime the place was full of school trips and coach groups. Although early in the morning up close to 1000m above sea level it was pretty cold and so we were pleased to beat the queues for the hot chocolate machine. Granada, being fairly close as the crow flies to Africa, has strong Moorish and Arabic influences and so is a nice place to see a different side of Spain. We’d also been told it was the best place to have tapas – although this is popular across the country, Granada bars have kept the tradition of serving free tapas dishes (small plates of food – bread, meat, olives etc) with every drink bought. On a sunny Saturday afternoon the cobbled streets were full of people spilling out of bars but we managed to squeeze into a few and have our own pub crawl Granada-style. Back on the bikes we started pedalling towards Portugal, knowing that we were only a week or so away from a holiday on the Algarve. Plans to take in Gibraltar on the way were shelved in favour of the more direct inland route to Sevilla and the Portuguese border. 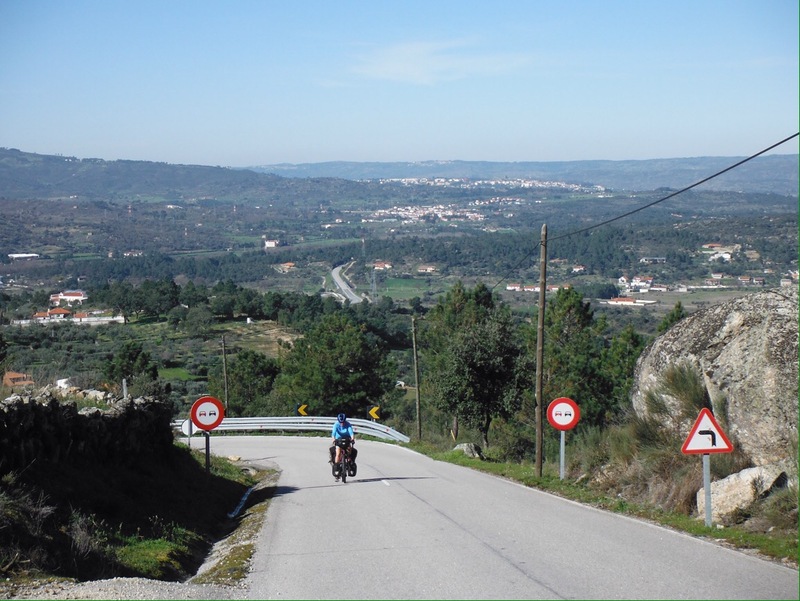 There is some seriously hilly terrain in Andalucia and for a couple of days we rode either up or down steep hills – no sign of flat ground or even a slight incline. But as is always the case, these roads have the best scenery and we joined up small white-washed towns that the region is famous for. The first night after Granada we stayed in an empty lodge on the edge of a natural park, and in trying to take a short cut through the park to get there ended up riding a steep downhill gravel road for the last hour. The view across the park and down into the valley we were aiming for as the sun set was magical but the last 10km in the dark was not so fun. The small inland towns and villages we were passing through could not have been more different to the coastal resorts that were only a 30 minute car ride away. We always stopped in one mid-morning for a break/toilet/50 cent coffee and even at this hour bars were full of men drinking coffee and spirits simultaneously. At one particularly memorable bar stop, an old guy was wobbling around at the bar drinking tequila trying to insist that I tried some – being an athlete in my prime this was not what my body needed for a hilly days ride but he was not taking no for an answer. He ended up spilling most of it on the floor which was a sad waste but probably the best outcome all round. The sun continued to shine, and we camped at the dramatic El Chorro gorge but were so tired from riding up so many hills to get there (much more total climbing than the day we crossed the Alps) we had to take a day to rest. Lucky we did as mid-afternoon the next day the sky turned black and it rained and hailed for over an hour, so loud that all conversations inside stopped as it was impossible to hear. Our tent was at the bottom of a path that soon turned into a river, and our porch was the most direct way for the water to get to the other side. All we could do was watch from our undercover vantage point and cross our fingers that the tent would pass its first serious wet-weather test. Aside from the river running through the porch and trying to wash away everything we had left in there, all seemed ok. Waterproofing test, passed; decision-making regarding tent pitching position, requires improvement. From El Chorro we climbed out of the gorge and over a few passes on our way to Sevilla. We called in to Ronda, balanced on the edge of a deep gorge, to admire the ridiculously impressive bridge and get my brakes fixed – the hills had taken their toll on the poor things. Sevilla is another Andalucian gem, and for the first time in a while we arrived at our destination with a few hours of daylight left to explore. Fancy buildings lined the wide streets, as well as many bars claiming to serve ‘world famous’ churros – strips of fried dough served with hot chocolate to dip them in. Of course we sampled this excellent cycling fuel. Strangely there was also a Christmas market – very odd (and unsurprisingly deserted) at the end of January. 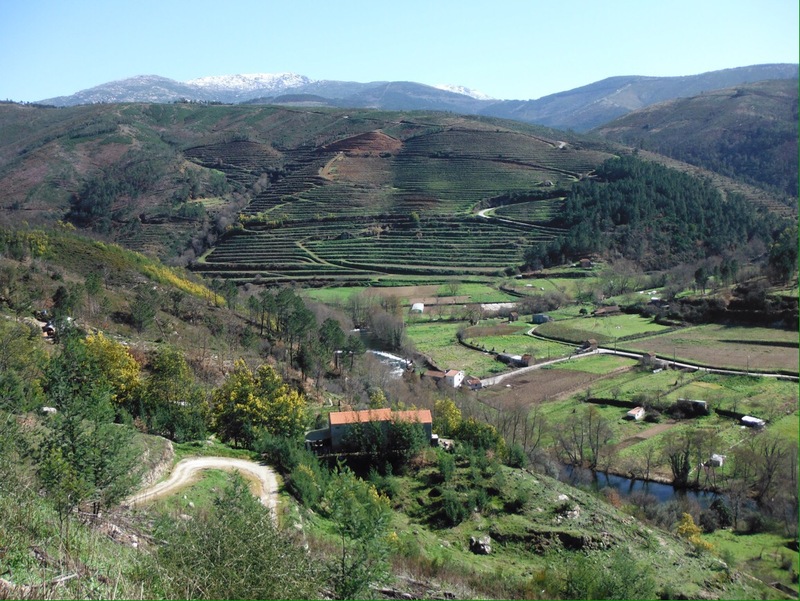 Towards the Portuguese border the landscape became flatter and filled almost entirely with olive or orange tree plantations. Our last night in Spain was spent sleeping on the floor of an aircraft hangar where we were invited to help ourselves to oranges from the trees. Our host for the evening told us that the cost of having the oranges picked is higher than they can fetch, which explained why we had cycled past so many overflowing orange trees with their fruits covering the floor and being left to rot. Thinking about vitamin c deficiency in kids in developing countries, this waste made us sad. Crossing into Portugal by the coast requires a short boat ride across the river Guadiana that forms the border. The first Portuguese resort of Villa Real felt different to Spain – the buildings were more jumbled after the uniform white-washed Spanish towns of Andalucia, and it was the first time in a while we had seen more holidaymakers than locals. Unfortunately as soon as we left town another main difference between Portugal and Spain became clear – Portuguese drivers are terrible, and the cycling experience is made worse by poor quality narrow roads. 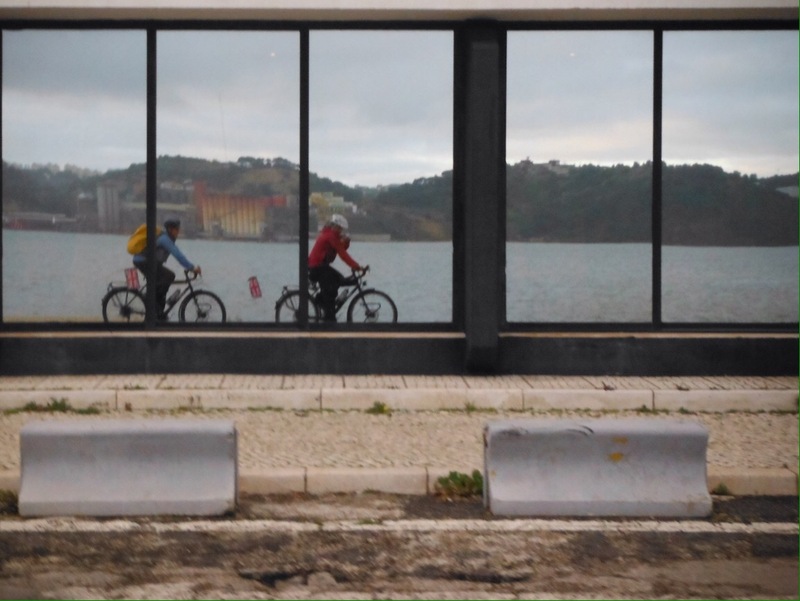 The only thing we could possibly do was search out the nearest bakery for a pastel de nata, a Portuguese custard tart, essential cycling fuel. After half an hour on the N125, the most direct way to Lagos at the Eastern end of the Algarve, we put our survival over speed and simplicity and tried to pick our way through small roads closer to the sea. 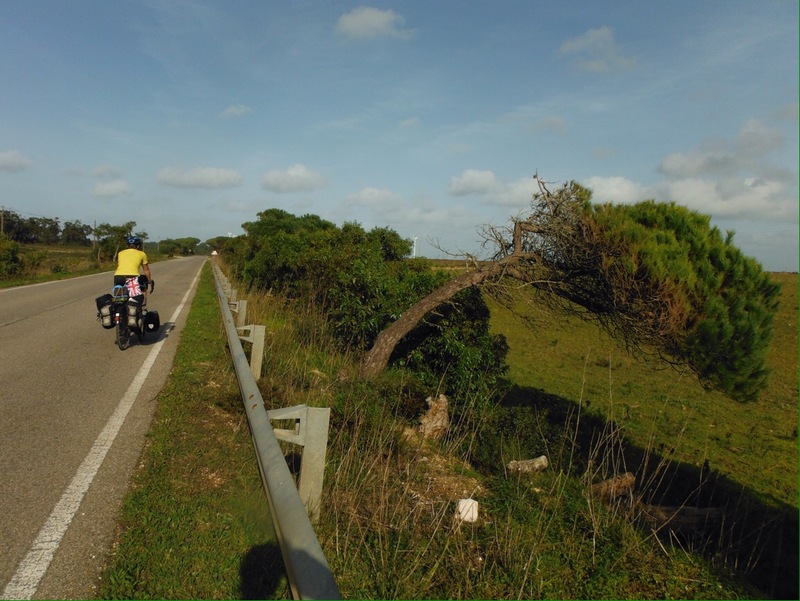 There is, in theory, a bike route stretching the whole length of the Algarve coast but after trying to follow this became frustrating we turned inland and didn’t join the coast road again until we were close to Lagos. Being inland meant that we didn’t have the opportunity to call in to beaches or resorts and the route was hillier but the roads were small, quiet and scenic. After a day and a half in Portugal we reached Lagos, excited about spending a few days in a tourist resort where we the high number of ex-pats meant that we could understand what was going on around us! 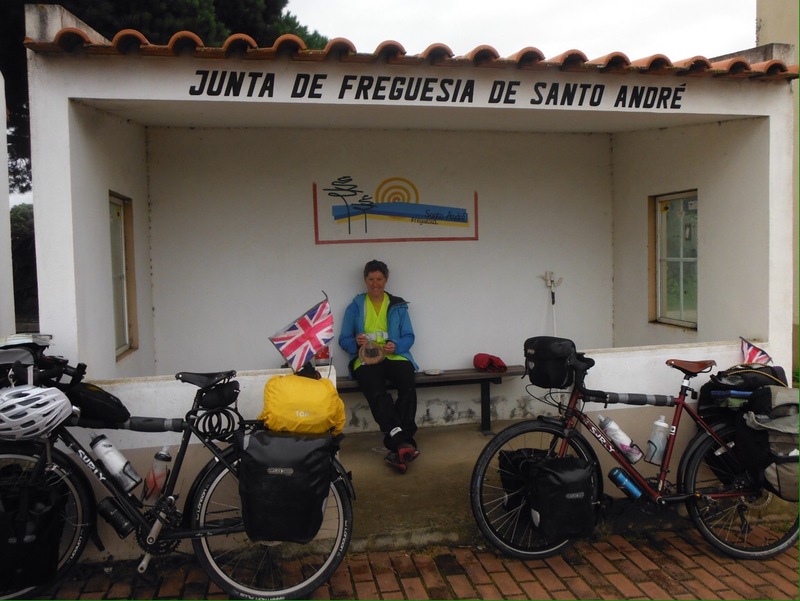 Thanks for this stretch to Maria and Zigor in Granada, Raul in Alcaucin, Moses in Utrera, Amelia in the aircraft hangar, Steve and Karen of http://www.my-bicycling-adventure.com and of course Jim and Tricia for allowing us to have a relaxing Algarve holiday.